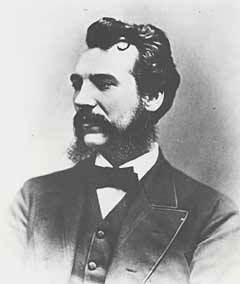 A young Alexander Graham Bell. Bell’s commitment to helping the hearing-impaired led to his invention of the telephone. He also founded communications giant AT&T. The roots of Bell Labs lay in the American Telephone and Telegraph Company (AT&T), which became the parent organization of Bell Telephone System. Founded by Alexander Graham Bell in the 1870s, by 1910, AT&T had grown from a tiny firm to a large corporation with several subsidiaries, one of which was the Western Electric Company. Western Electric, the manufacturing branch of AT&T, made telephones, switchboards, and other types of equipment. 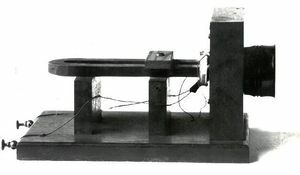 Following in the footsteps of Thomas Edison’s famous research laboratory in New Jersey, Western Electric in 1907 created a special research department to bring together various experimental efforts aimed at improving telephone equipment, and to develop and patent new products to keep ahead of the competition. During the rest of the decade and into the late 1920s, Western Electric engineers developed new types of switchboards (notably the panel switch) and telephone cables and the first electronic amplifiers, Harold Arnold's high vacuum tube. The success of the latter, which solved AT&T's most pressing technological problem, how transmit a telephone signal across the North American continent. convinced AT&T that investing in in-house research and development was a sound business strategy. Bell Labs found many new uses for the vacuum tube, exploiting it in areas including public address systems, radio, electrical phonograph recording, synchronized sound motion pictures, and transoceanic radio telephony. 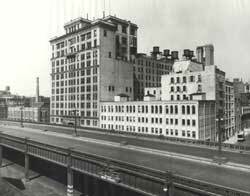 Bell Labs' New York City building, in the mid-1930s. Courtesy: Lucent Technologies. By the early 1920s the research effort had grown so large—over 3600 employees by 1924—management decided to split it off into its own organization. This new subsidiary Bell Telephne Laboratories Inc. began operations on January 1, 1925. It was owned jointly by AT&T and Western Electric, and occupied the existing research building in New York City. Bell Labs was on its way to becoming the world’s largest industrial research laboratory. In the 1930s and through the end of World War II, Bell Labs continued to expand. The company established new research facilities in New Jersey, where open land was still plentiful and cheap, and radio research could be conducted free of the interference found in New York City. The huge resources of AT&T, which had a monopoly on telephone service, enabled Bell Labs to undertake fundamental research that had only loose ties to ordinary telephone service. In 1933, for example, Karl Jansky, working at the Holmdel, New Jersey facility, discovered radio astronomy. Another trend was closer cooperation with the military, which had begun during World War I, and which continued in the 1930s as Bell Labs began working on radar and military communication systems. When World War II came, Bell Labs invented or improved numerous military systems, such as the two-way radio, proximity fuses, semiconductor devices, radar, sonar, computers, the “bazooka,” and the first encrypted communications systems. This system, Sigaly, enabled US President Franklin Roosevelt and British Prime Minister Winston Churchill to hold regular telephone conversations across the Atlantic. 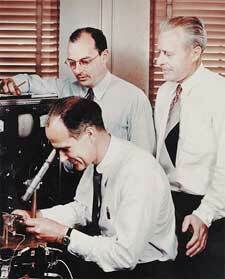 Transistor inventors William Shockley (seated), John Bardeen (in glasses), and Walter Brattain in a 1948 Bell Labs publicity photo. Courtesy: AT&T. At the end of the war Bell Labs was at the peak of its power. From the late 1940s through the late 1970s, it reigned unchallenged as the largest and perhaps most inventive industrial laboratory in the world. Its engineers and scientists invented or brought to fruition numerous technologies, including the first transistor and many of its important variations. Although the integrated circuit was invented elsewhere, construction techniques invented at Bell Labs established many of the necessary precursors to it. The same could be said for fiber optic transmission, electronic switching systems, cellular telephony, satellite communication, solar power, and other technologies we use today. Although not all of their elements were invented at Bell Labs, it was there that the long and incredibly expensive development process brought them to maturity. And while there were notable failures, such as the “Picturephone” system, there were numerous inventions, some little-known at the time, which later became very important. The Charge-Coupled Device or CCD, now universally used in digital cameras, video cameras, the Hubble telescope, and elsewhere, was one such development. Bell Labs engineers Willard Boyle and George Smith invented it in the 1970s. The dominance of Bell Labs faded after 1984, when the courts found that AT&T was a monopoly and mandated that the company divest itself of its local telephone operations. These divested operations became the seven regional "Baby Bells." The small portion of Bell Labs whose research supported local telephone operations was spun off as well as Bellcore, jointly owned by the Baby Bells. But with Bell Labs now being owned by a much smaller company in the competitive businesses of long distance telephone service and telecommunications equipment, the financial resources were much smaller, and Bell Labs gradually contracted, particularly in pure research. In 1996, the remaining AT&T split again, spinning off its manufacturing operations as Lucent Technologies. The labs split as well, with researchers following the business whose work they supported. Three quarters of the staff, and the Bell Labs name went to Lucent Technologies, while the remainder remained with AT&T as a new AT&T Labs. Today’s Bell Labs, a part of what is now the Alcatel-Lucent Corporation, is a smaller but still very important organization that focuses its research on next-generation products for voice and data communication. This page was last edited on 1 August 2016, at 19:19.